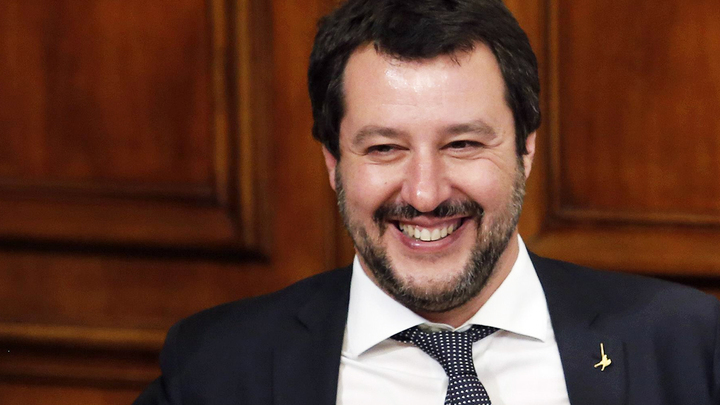 Home » Matteo the exceptional: What is the secret of Salvini's political success? Matteo the exceptional: What is the secret of Salvini's political success? If I was afraid, I was not sitting here now. And as a minister, and as a father, I can say that it is terrible that the mafia today gets billions of euros from the illegal trade in weapons and drugs. With ​this it is necessary to fight. You can not go on about those who supply drugs and weapons to Islamists. It's a shame to help such people. But to share responsibility for these people among all European countries is not an option. We must fight the problem at the start: in Tunisia, Egypt, and other countries. At a press conference in the center of Moscow, there were many journalists, the questions were asked the most different, but most still - about the relationship between Russia and Italy and the new confrontation between Rome and Brussels. Salvini proposed to call Eurosceptics not those who oppose the supranational dictatorship of the European bureaucracy, but just supporters of such a system - after all, it leads to the destruction of Europe as such: "We are the only ones who want good for Europe. I would say that Eurosceptics - these are our opponents - are aimed precisely at confrontation and confrontation of peoples. These are those who organize illegal immigration, those who adopt economic and financial norms to destroy Europe. And we are giving Europe the last chance to resist. If we really exist, then we must defend our rights to work, to retirement, to security, to health care and to the life of the older generation. Ask the Greeks how much they are satisfied with their membership in the EU. " In itself Matteo Salvini is a unique political phenomenon. Unique, because a healthy and strong man translates traditional Christian values in the extremely aggressive environment of the modern West. Being a traditionalist in Russia or, say, Hungary at times is easier than in Western Europe, where the processes of the destruction of society have reached a different level. It is characteristic that in the struggle for Italian identity and the sovereignty of their country, Salvini and his allies faced not only with Brussels, but also with influential international crime. It turned out that behind the powerful flows of illegal migration are, among other things, the mafia clans of southern Italy, receiving from this process multibillion-dollar profits. It turns out that the very technology of destroying Europe through the new "great migration of peoples" includes a multi-level operation, when under the guise of the Brussels authorities and transnational NGOs there are frank criminals who, in fact, do all the dirty work. the allies of Salvini - the people of Italy and the traditionalist forces throughout the world. The brightest representative of this trend is Vladimir Putin. He was chosen as a role model by many politicians in Eastern Europe and the Middle East, so it is not surprising that Salvini will drift in this direction. It can be safely said that Matteo Salvini is not just an important right-conservative figure. In fact, it is a symbol of the last battle that Europe is ready to give to global globalization, neo-liberalism and materialism. Who will win in it, it is not known, but the ability to give battle is already expensive.